This past fall at the University of St. Thomas was one of the greatest semesters in my life. The incredible sisterhood that is shared on the Catholic Women's Floor in Dowling Hall, where I lived, is incomparable. It is from this community that this quote arises and thus the title of this website. 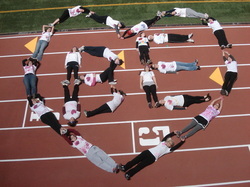 Our theme this year is "Be Bold, Be Love, Be You!" and the saint we chose that best embodies this mantra is Blessed Pier Giorgio Frassati. There are a number of reasons why we chose this vibrant, young Italian to be our special intercessor and role model for the year. An avid outdoorsman, Pier Giorgio possessed a true sense of adventure and love of life. Mountain climbing was a passion of Pier Giorgio's, for he viewed the peaks as unique places to encounter God and the mystery of creation. Every climb up a mountain was a physical and a spiritual exercise and a mountain truly bridged earth and heaven. He is known for saying, "The higher you go, the better you shall hear the voice of Christ!" Our Catholic community is on the 6th and topmost floor of Dowling Hall - a factor that we joke about in relation to this quote! He often organized climbing parties with his friends where his contagious energy and carefree nature brought tremendous joy to all involved. More importantly, Pier Giorgio was known as the "Man of the Beatitudes," referring to his selfless commitment to Gospel values every day of his life. This is truly what "being love" is all about! There are countless stories of the creative charity with which Pier Giorgio lived each day. He was known for using his own savings to provide for the poor, such as giving his train fare to a poor man so he could buy food, and in turn running home so as not to be late for supper. He would often empty his pockets into the hands of a needy person and would even take the coat off his own back to give to a poor beggar. When walking down the winter street in only a blazer people would ask if he was cold, to which he would respond, "No...I'm a mountaineer after all!" Pier Giorgio was truly "poor in spirit," not passing judgment on anyone, but showering upon them the love of Christ. He would often distribute Bibles and copies of great spiritual books, such as "Imitation of Christ" and encourage the poor to go to Mass. His love of neighbor sprang from his great devotion to the Eucharist. He would leave his home early in the morning to receive Holy Communion. He would often make bets with friends and tell them, "If I win, you must give me an hour of your time." When he won (which was frequent) he would bring them in front of the Blessed Sacrament. Deep prayer was also part of his everyday life and its fruits were seen in his cheerful disposition, sincere manner, and youthful joy. The women of our floor are truly devoted to the Eucharist, making holy hours and attending Mass together. We pray Night Prayer each evening as a group, and in doing so grow closer to the Lord and each other. Pier Giorgio also possessed a great devotion to the Blessed Mother, and when his family lived near a particular shrine to honor the Virgin Mary, he would visit it nearly every day. He even devised a system of being awaken early so he could make these visits, without his family knowing. His friend the gardener would tug a rope that was tied to Pier Giorgio's fist, and it did the trick! Not only does our floor possess a small shrine to Our Lady of Guadalupe in our bathroom to show our devotion to Mother Mary, many of us have also completed St. Louis de Montfort's "Total Consecration to Mary." 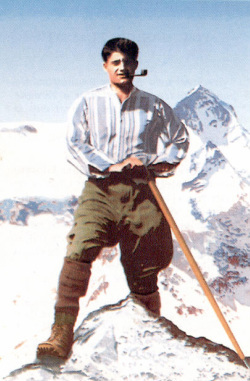 Blessed Pier Giorgio Frassati is truly a saint for our times and a shining example of holiness! This quote of his beautifully exemplifies the life that he lived and is encouragement for each of us as we aim to become "set apart" for the Lord, to become saints, and get to heaven! The Catholic Women's Floor community has truly helped me on my path to sanctity and I know that my Roman adventure will be full of experiences in which I grow in holiness. It seems truly fitting then that I entrust my Italian adventure to this great Italian. BLESSED PIER GIORGIO FRASSATI...PRAY FOR US!! !